Thiruvidanthai is one of the 108 principal Vaishnavite Divya kshetrams. Here the Lord appears as Varaha murthy(wild-boar face) called as the Sri Lakshmi Adi Varahaswamy, who has his right foot resting on the Adi Sesha. 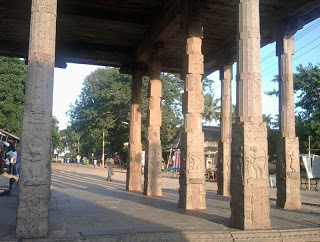 The Epigraphical plaque ( which is sadly in a dilapidated and difficult to read condition now) found in the temple precincts mentions that the temple dates back to 8th Century A.D. From the 10th to 16th centuries A.D. Chola, Udaiyar, Rashtrakuta and Pandyan kings have worshipped the Lord at this . Raja Raja Chozha is said to have celebrated a 7day festival during the Tamil calendar month of Aavani and a 9day festival for Panguni Uthiram.. Vijaya Rajendra Chozha is said to have donated this entire village to the Thiruvidanthai Lord. According to mythology, there was an 'asura' named Meganathan who had a son called Bali and he was ruling the place striaghtforward and with honor.Three asuras named Mali,Maliavan and Kumali wanted this king Bali's help to fight against the devas. Bali refused to fight the devas. Hence these three asuras fought with the Devas and eventually lost the war. They came running and surrendered before the king Bali. He then took over and fought the devas and won the war. However, regretting his action against the devas, this king Bali undertook a severe penance near the 'varaha theertham' seeking forgiveness for his action.Pleased with his penance, Lord appeared before him as Adi Varahamurthy and Bali attained salvation. A sage called called Kalava rishi came to this place along with his 360 daughters and begged the Lord to marry them. It is said the Lord himself came down before the sage in the form of a bachelor and in pursuance of the sage Kalava’s earnest prayers, agreed to marry all his 360 beautiful daughters. So, in the next 360 days, He married all these maidens, one by one for one whole year. Hence, he earned the name ‘Nithya (daily) Kalyana (marriage) Perumal (the Lord of Lords)’, meaning ‘the Lord who gets married every day’ and on the last day he made each of the 360 brides as one and placed Her on His left thigh and took the avatar as Adi Varah Murthy here.Since He has His placed his bride on His left side this kshetram was called as Thiru eda enthai ( 'edam' means left) and colloqially became Thiruvidanthai now. Since he got married daily , he is also called as Nithya kalyana Perumal. 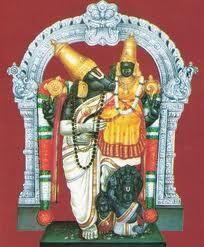 The Goddess Thayar here is called as Komalavalli Nachiar. It is believed, and has also been proven that marriages that have not been materialising for a long time for either the boys or girls, materialises within 45 days if they sincerely come and worship this Nithya Kalyana Perumal by following certain simple rituals. 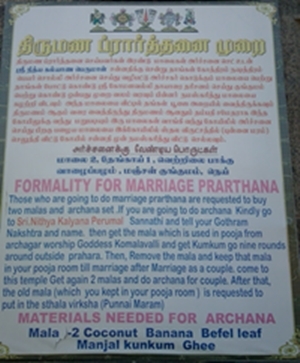 Whether it be a boy or a girl, they need to take two garlands along with archana materials. After placing the garlands to the Perumal and Thayar, the priest will return one of the garlands. The boy or girl who is expecting to get married should wear the garland and after offering their sincere prayers should come around the praharam ( inner compound of the temple) nine times.They should preserve the garland in their home till marriage gets fixed. Once the marriage is over, the married couple should visit the temple again and place the garland over the 'Punna' tree , the sthala vriksham of the temple. Temple timings:Morning 5:00 Am till 11:00 AM and 4:00 pm to 8:00 pm. How to reach:This temple is located on the East Coast Road, around 40 kms from Chennai, before Mahabalipuram.There are many local buses that ply via this temple. It is also a great experience to travel by your car, through the beautifully laid toll road , enjoying the scenic beauty of the beach on your left side,passing Mayajal, several theme parks and the Muttukadu back waters. Where to Stay? Chennai has many star hotels,deluxe,semi deluxe and economy hotels,besides the Mahabalipuram area has plenty of beach resorts.